030. POLAR EXPLORATION. Issued in a series of 25 by John Player & Sons in its "Polar Exploration" series (Date? Post 1909 but prior to Scott's death.). Size: 2.62" x 1.4". 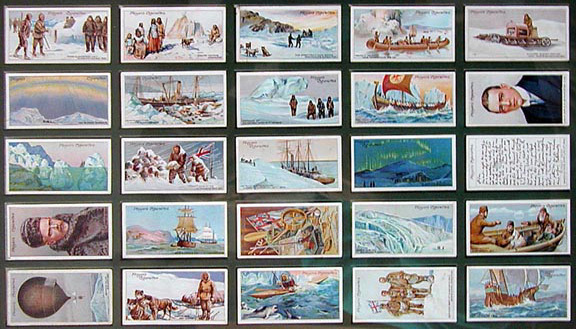 Recto: Chromolithographic images from both north and south polar regions. Title is given at one end of the card and "Player's Cigarettes" appears at the opposite end. Verso (typical): A SERIES OF 25 | POLAR EXPLORATION | [card number] | [Title and Description] | Issued by the | JOHN PLAYER & SONS | Branch of the Imperial Tobacco Co. | (of Great Britain & Ireland), Ltd. | Nottingham. 2. Dr. Fridtjof Nansen, G.C.V.O., F.R.G.S. 3. How Icebergs are Formed. 5. Parry and Hoppner's Arctic Expedition. 6. Eskimo with Dog Sledge. 7. Ross and Parry's Expedition, 1818. 8. Commander James Ross at the North Magnetic Pole, 1831. 9. Peary's Arctic Expedition, 1898-1902. 10. Eskimo with their Toupiks or Summer Tents. 11. Eskimo Hunting Seal in a Kayak. 12. Relics of the Franklin Expedition. 13. The "Nimrod" picking up the Northern Party. Early in 1909, the Northern Party of the Shackleton Expedition returned from the South Magnetic Pole, and were encamped on the Drygalski Glacier. Their position was a trying one. While discussing the alternatives of a long wait on the glacier or a tedious and dangerous sledge journey, they were overjoyed to hear the ship's guns. On Feb. 4th, 1909, they were picked up by the Nimrod. 14. A Remarkable Fumarole in the Old Crater of Mount Erebus. A fumarole, or volcanic vapour well, is unsually detected by the thin vapour column issuing from it. In Antarctic regions, however, the cold freezes the vapour as it reaches the surface. Thus there are built up round the orifices ice-mounds which are often of peculiar shape. One observed by the Shackleton Expedition, 1907-9, was in the form of a couchant lion. 15. Start of the Western Party from Cape Royds. Shackleton's Antarctic Expedition, 1907-9. The Expedition wintered at Cape Royds, Ross Island, fifteen miles from Mount Erebus, an active volcano 13,000 feet high. On Dec. 1st, 1908, the Western Party left the winter quarters for the first time, to convey stores to the Northern Party on its return from the South Magnetic Pole. During a second journey the Ferrar Glacier was explored. 16. The Northern Party at the South Magnetic Pole. The Northern Party, sent by Lieut. Shackleton to the Magnetic Pole, was in charge of Prof. Edgeworth David, F.R.S., of Sydney University. They left winter quarters in Sept. 1908. On Saturday, Jan. 16th, 1909, they reached the calculated position of the Pole--72° 25'S. latitude, and 155° 16' E. longitude. The Union Jack was hoisted, and the surrounding country formally added to the British Empire. 17. The Ferrar Glacier. The Western Party of the Shackleton Expedition camped at the foot of this glacier on Dec 4th, 1908. On Dec. 15th the ascent was commenced, Christmas Day being spent on the glacier at an altitude of 2,470 feet. A geological survey of the glacier was made by the scientists who accomapanied the expedition. 18. The Aurora Australis. The phenomenon, so well known in the northern hemisphjere as the Northern Lights, or Aurora Borealis, also occurs in the Antarctic regions, where it is known as the Aurora Australis. 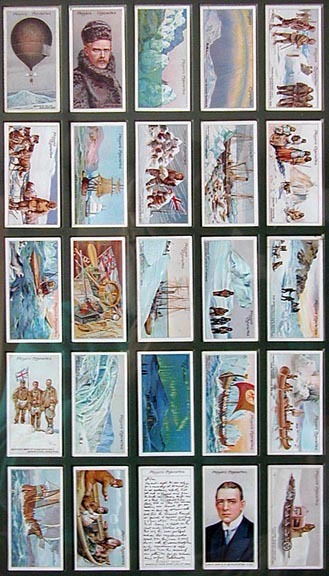 Many brilliant displays were recorded by the Shackleton Expedition, 1907-9. Curtain aurora of the type illustrated were frequent at Cape Royds. 19. The Discovery of Greenland. 20. Sir John Franklin's Arctic Expedition, 1819-22. 21. Cabot's Voyage in Search of a North-West Passage, 1497. 22. Henry Hudson Cast Adrift. 23. An Extract from Sir Ernest Shackleton's Diary, Jan. 4th, 1909. Our illustration shows a page of the explorer's diary, written at a latitude between 87° and 88° S. Here, at an altitude of 11,200 feet, the cold was intense, the temperature at night being -24° Fahr. Five days after the extract was written, on Jan. 9th, 1909, the expedition reached a latitude of 88° 23' S., the farthest south ever attained. On January 10th the return journey commenced. 24. Lieut. Sir E. H. Shackleton, C.V.O. Lieut. Sir Ernest Henry Shackleton, son of Henry Shackleton, M.D., was born in 1869, and educated at Dulwich College. He commanded the British Antarctic Expedition, 1907-9. With this expedition the explorer reached a latitude of 88° 23' S., thus planting the British flag 100 miles nearer to either Pole than had previously been atained. In 1909 Lieut. Shackleton was made a C.V.O., and received the honour of knighthood. 25. The British Antarctic Expedition, 1910. A motor-sleigh tractor. On Wednesday, June 1st, 1910, there set sail from London the expedition which will, it is hoped, nail the Union Jack to the South Pole. The Commander, Captain Robert F. Scott, R.N., is relying for purposes of traction on motor-sleighs of the type illustrated. They are fitted with 4-cyl. vertical motors, and the chain-wheels drive an endless chain designed to grip in the snow and ice.